When Pokemon Let’s Go Pikachu and Eevee were first announced, I was unsure on its mix of classic mechanics and those lifted from Pokemon Go. Now, however, I’m convinced one major change is the future of the series. That change is the decision to strip wild Pokemon battles out of the game. This is part of a larger suite of changes, including a catching mechanic lifted directly from Go and the elimination of random encounters in favor of you seeing Pokemon out on the overworld, thus allowing players to choose which to engage with by coming into contact with them. The actual Pokemon Go catching mechanic I can take or leave, but the other two changes are perfect for the future of the series. The jump to a high-spec, high definition machine in the Switch provides The Pokemon Company and Game Freak a unique opportunity to rethink certain aspects of the series, and I think largely getting rid of actual battles with wild Pokemon makes a lot of sense in that mission for numerous reasons. One of the major triumphs of Pokemon Let’s Go is that it’s the Pokemon game that feels closest to the experiences the series has always aimed to explore in other mediums like the anime, movies, and manga. In these settings, battles against trainers are an event – they’re something that matters, and in Pokemon Let’s Go they feel a little more special to me than they have in any other game in the series. The reason why is pretty simple: I’m not slogging through hours and hours of wild Pokemon encounters that essentially use the same mechanics. That means I’m more inclined to treat battles as special, and when working through longer dungeon-like areas like the early game Mt. Moon and the late game Victory Road, I’m far more inclined to seek out every trainer battle I can rather than eagerly searching for the zone exit to get out of random encounter hell. 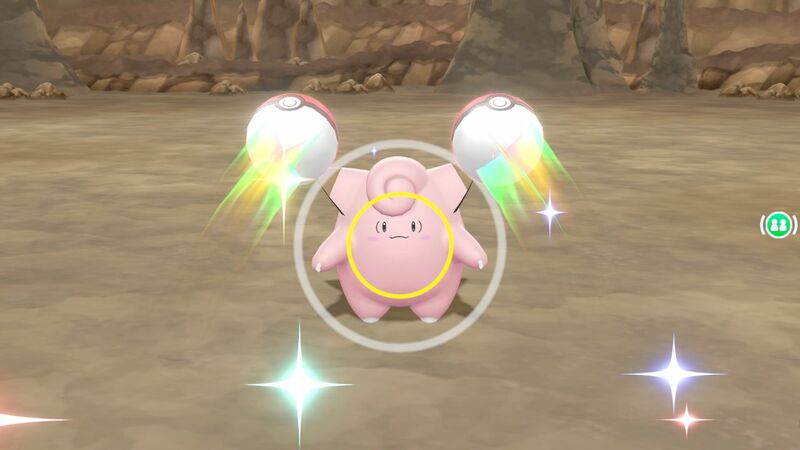 Many other aspects of Let’s Go help you to feel more like you’re in the Pokemon world as depicted in other mediums not restrained by the need to accommodate specific game mechanics, but the shifting of encounters from random battles to more easily premeditated catch-focused system really makes a world of difference. It’s not just trainer battles it makes more special, either – there are Pokemon encounters in Let’s Go that do force a fight on you beforehand (bringing the classic wild encounter music back with it), and when that happens you know that this is a different and special encounter, even when it isn’t a legendary Pokemon. The whole change also fits better thematically with the very friendly image for the series anyway – with Pokemon as willing, loving companions to humans rather than animals you beat unconscious in order to grind up the levels of your own loyal beasts. Again, this is how it’s all more frequently portrayed in the anime and other Pokemon stories anyway – it’s just this storytelling is finally making its way back over to the games – and it makes sense. I want to be clear on one other point, too – Pokemon Let’s Go has a serious difficulty problem, with encounters all too easily brute-forced with just a tiny bit of grinding – but this problem hasn’t been caused by this systemic change. So, yes, the change fits Pokemon – but also, let’s be fair for a moment: random encounters haven’t aged well, and at this point they belong in a very specific sort of game. I don’t intrinsically hate random encounters – I gave retro throwback, random encounter-driven RPG Octopath Traveler a glowing review and am a huge nerd for classic RPGs – but I do think a series like Pokemon, focused on younger players as it is, should be forward-thinking and progressive in its design. Because of that, maybe it’s time for the random encounters to go – and with them, the wild Pokemon battles, replaced by something else. As I said earlier, I’m not entirely convinced that the replacement solution for losing wild encounters is the exact Pokemon catching system from Pokemon Go. In Let’s Go it makes sense, furthering that game’s status as a gateway for players only familiar with Pokemon Go to get into the series. In general, however, it’s a too-simplistic approach to catching that could certainly be finessed to require more skill and offer more options as you get into the late game and start trying to catch more powerful, impressive Pokemon. Perhaps the answer could be half-and-half, too, where Pokemon species are designated as either aggressive or passive, and you only have battle encounters with aggressive species (and perhaps aggressive species could rush you on sight – anything to get that wild battle rate right down, in turn making the battles you do have more stand-out and special. Whatever the final answer, one thing is now certain to me: random encounters and super-common wild Pokemon battles should be reconsidered and likely replaced in the next entry. This is a change I didn’t know I wanted for the series until Let’s Go forced it upon me, and now I can’t imagine the next game with those traditional systems as they were.